For decades farmers in the southwest of Australia have been convinced that there are cougars at large in the Australian bush, devastating wildlife and livestock. Hundreds of sightings have been documented in Western Australia, from as far north as Geraldton, south to Esperance and inland to Norseman. 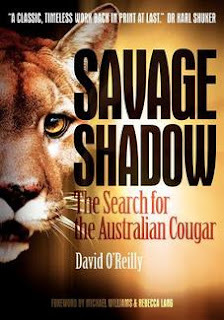 Australian journalist David O'Reilly became fascinated with what is known as perhaps Australia's greatest wildlife mystery during his time as the bureau chief of The Australian's Perth office. He interviewed scores of witnesses - farmers, wildlife experts, academics and bureaucrats - and wrote many stories about the hunt for the 'Cordering Cougar', as it became known, during the late 1970s and early 1980s. This book, now back in print for the first time in 30 years, is the culmination of that work.